Ileus in guinea pigs has a strong stress-related component. If your guinea pig has discomfort, pain or stress, look for gastrointestinal tract problems first. 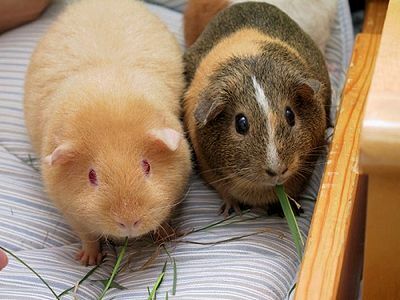 In order to keep their systems functioning properly, guinea pigs need to have food going through the gastrointestinal tract almost constantly. Ileus is a slowing or stoppage of the gut workings also known as gastrointestinalasis. There are a number of reasons why ileus may present itself – too little fiber in the diet, obesity, pain, improper use of antibiotics, foreign body in the GI tract, stress, dental problems. Symptoms include decreased appetite, odd sounds from the gut, decreased amount or odd shape of stool, weight loss, lethargy, hunched over body, unusual vocalizations. When guinea pigs don’t eat properly, their teeth do not wear down, they can become anorexic which leads to ileus. Diagnosis is made through a general physical examination, blood tests including a chemistry panel, x-ray, ultrasound, dental checkup possibly with a CT scan. Treatment may mean a hospital stay and includes administering fluids, nutrients, pain management and other medications. Surgery is rarely necessary. Continued monitoring of the guinea pig’s health is important with regular checkups at the vet. Prognosis depends on the causes and severity of the condition.